Are Unemployed Professors Writing Student Papers for Employed Professors? 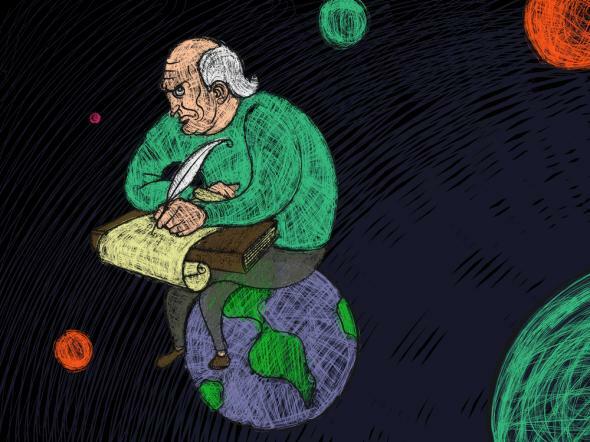 Artist’s rendering of an unemployed professor sitting astride the Earth, writing a student paper for an employed professor. A few months ago, I called for the end of the traditional undergraduate essay. It’s a tired format, I argued, that often results in cheating and half-assed, rushed arguments. By insisting that students churn out paper after paper, from which said students often learn little other than the delicate art of margin manipulation, today’s professors accomplish little other than the perpetuation of their own grading martyrdom. Most of this, of course, came not from students in zealous defense of the essays they so adore, but from the professoriate. It turns out that the academics of America have a manic, violent reverence for the traditional essay, one so fierce that the mere suggestion that it does not produce a generation of pensive, erudite philosopher-kings is enough to ignite an Internet-wide temper tantrum. Why do professors cleave onto their crown of grading-thorns so? Is it out of terror that if they lose their red-pen stigmata, they’ll simply vanish from the Earth? It’s a mystery. Or at least it was. But now I understand: A halt to the college essay might also mean the abrupt stoppage of the gravy train for many of these righteously offended compositionists. UnemployedProfessors.com is a paper mill based out of Montreal—but it’s not just any paper mill. If you’re going to pay $200 for someone else to write your essay for that professor who insists essay-writing is the most important part of college, then at least have that essay be written by another professor who believes that essay-writing is the most important part of college. Yes, Unemployed Professors purports to hire exclusively casualties of today’s academic job market to write all the essays, so that students can spend their valuable time attending racist frat parties. Well, actually, they claim to hire both current and former academics, but, as the URL suggests, the emphasis is on the latter. And you have to admit, there is a certain aesthetic perfection to a 100-percent professor feedback loop: professors producing papers for professors, who then simultaneously bemoan the grading of those professor-written papers to other professors and hate-mail other professors about said professor-penned treatises’ immortal worth in the curriculum. And yet! You also have to wonder about the ethics of the whole operation—and out of Canada, no less. (First Dave Foley and Will Sasso break bad on Justified, and now this?) The company claims indemnification from legal issues by placing the onus for turning in original work squarely on the student—and indeed, if the unemployed professor just can’t resist using Foucault and Heidegger to explicate The Epic of Gilgamesh, and the employed professor rightly sniffs out a ringer showing off, it’s the student who gets punished. The company justifies its existence by pointing out that the current academic labor climate is hardly a paragon of laudable behavior. This might be true, but the logic doesn’t compute: Universities don’t have enough tenure lines … ergo, students are excused from having to complete and submit their own work? That’s as perplexing as the defense of the essay in the first place, and I can only hope the unemployed ethics professors Unemployed Professors employs employ slightly better reasoning in the ethics papers they unethically write for others. Oh, and I almost forgot: For all you unemployed Ph.D.s out there, here’s how to submit an application.